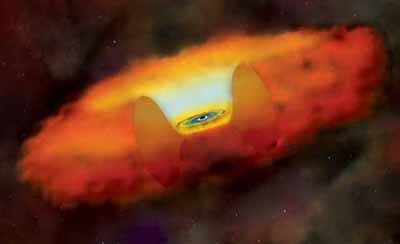 An artist's conception of a black hole and forming galaxy. The study of galactic formation is an open area of research in modern astrophysics. Scientists suspect that as luminous matter is drawn inwards towards a halo of dark matter, a massive star-like object takes shape. Because of its huge mass this object soon collapses into a black hole. As more matter is accumulated, it begins to rotate around the halo, forming a flat disk which spins faster and faster as the mass increases. This gaseous disk begins to resemble an irregular galaxy as hydrogen gas and dust collapse to form stars. Over billions of years the newborn galaxy will continue to grow and evolve as it interacts gravitationally with other primordial galaxies. Although its makeup remains a mystery, scientists have strong evidence indicating that most of the matter in the Universe is dark. Unlike luminous matter, dark matter does not emit any electromagnetic radiation and thus cannot be seen directly. It is predicted that dark matter has an especially important role in the formation of galaxial structure. In the early Universe, the concentration of radiation was much higher and the gravitational attraction between pockets of luminous matter was opposed by the force of radiation pressure. Since dark matter does not absorb or emit photons, it was not subject to the opposing force of radiation pressure and was able to collect long before luminous matter could. Without dark matter, the formation of galaxies would have occurred billions of years later than it actually did.